On this day in 1993 one of the biggest baseball stars of the 1990’s and 2000’s was drafted in the MLB Draft. The Seattle Mariners used their #1 overall pick in 1993 to draft Alex Rodriguez. 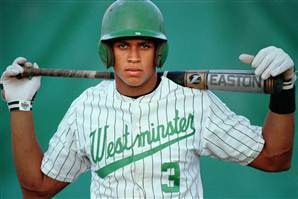 Rodriguez was drafted after his senior year of high school where he played at Westminster Christian High School. He was a highly touted player during high school, hitting .419 over 100 games. He would go on to be the highest paid baseball player at the time when he signed a 10 year $252 million deal with the Texas Rangers in 2000. Rodriguez also became the youngest player to reach 500 career home runs at age 32. This entry was posted in MLB, sports, Sports History and tagged $, 1993, 252 million, 500th, a-rod, alex, draft, first overall, home run, mlb draft, rodriguez, seattle mariners, texas rangers. deal, Westminster Christian High School, what year. Bookmark the permalink.